EU Enlargement Commissioner Štefan Füle has said in Istanbul that Turkey must investigate the excessive use of force by police against anti-government protesters. Štefan Füle was speaking ahead of talks on Turkey’s ambition to join the EU. In response, Turkish PM Recep Tayyip Erdogan said similar protests in Europe would be dealt with more harshly. Štefan Füle and Recep Tayyip Erdogan were both speaking at a conference in Istanbul on Turkey’s relations with the EU. 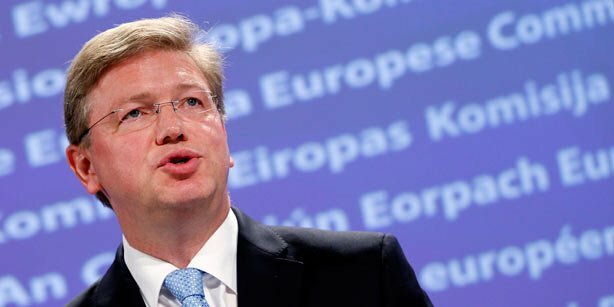 The EU enlargement commissioner said the EU had no intention of giving up on Turkey’s accession, but Turkey had to maintain values of freedom and fundamental rights. He urged a “swift and transparent” investigation and those responsible should be held to account. “Peaceful demonstrations constitute a legitimate way for groups to express their views in a democratic society,” Štefan Füle said. In response, Recep Tayyip Erdogan accused the EU of double standards, saying police in Europe and the US used similar methods. The Turkish government has acknowledged that police used excessive force against the original protest over the planned redevelopment of Gezi Park in Istanbul. But they say the wider protest movement that ensued in cities across the country has been hijacked by extremists. Last night Recep Tayyip Erdogan called for an immediate end to the demonstrations, saying they bordered on illegality. In a defiant speech to supporters on his return from a four-day tour off North Africa, he accused the protesters of looting and said they had lost democratic credentials. Turkey’s hopes of EU membership will not be helped by the worst civil unrest for decades. Turkey formally applied to join in 1987 and started accession talks in 2005. Human rights concerns have always been an important obstacle to Turkey’s membership bid, along with the division of Cyprus and other issues. But both France and Germany have recently softened their stance on Turkish accession. On Thursday night Recep Tayyip Erdogan was welcomed back to Turkey by thousands of cheering supporters who waited at the airport to greet him. He responded to calls for his resignation by referring to his election victory in 2011 when he took 50% of the vote. The protesters accuse Recep Tayyip Erdogan’s government of becoming increasingly authoritarian and trying to impose conservative Islamic values on a secular state. Recep Tayyip Erdogan’s Justice and Development Party (AKP) has governed Turkey since 2002, winning successive election victories. Who is Alina Kabaeva, Vladimir Putin's alleged mistress?